The best water views are at Dock & Dine on the Connecticut River at Long Island Sound. Open year round for lunch, dinner, lounge menu and cocktails – featuring New England clam chowder, traditional and contemporary seafood selections, steaks, chicken and pasta dishes. 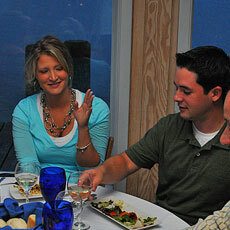 Indoor and outside waterfront dining at its best! Seniors' Day – Every Wednesday! Show your Senior ID* and get 25% off your lunch until 3pm. *Ages 62 and over. Cannot be combined with other discounts or offers.